Cyprus potatoes, waxy, red-skinned, firm-fleshed, the Peter Andre of the spud world, are flexible: while I’ve roasted the older ones, the ones in the shops right now are new, great simply boiled in their skins and slick with mint and butter. Cypriot potatoes are one of the best to cook with, coming from the iron rich red soil farms of that divided island. In North london, we are lucky, we have a sizeable Cypriot population, particularly at the fabulous shops in Green Lanes, where we can buy them, but they are also available at Tesco. This recipe, Skordalia, classically Cypriot, sounds rather unglamorous on the page, consisting of cold mashed potatoes used as a dip. It doesn’t sound too appetising does it? Well you are wrong there, it’s super moreish, my lot couldn’t stop eating the stuff. One day we had it as part of some meze, the next as an accompaniment to roasted salmon. Garnish with fresh mint (one of the most popular herbs in Cypriot cooking) and flat leaf parsley pesto. This is easier if you have a food processor or an electric mixer, it’s got to be as silky as a babies bottom, lumps would ruin it. Put the potatoes into a pan of salted cold water and bring to the boil.Boil for ten minutes then drain. Crush the garlic in the blades of the food processor or mince beforehand. Add half the potato, and olive oil and process until smooth. Squeeze the lemon into a jug and dissolve a tablespoon of salt in the lemon juice. Mix the rest of the olive oil and egg into the jug, whisking thoroughly. Add the rest of the potato and the contents of the jug into the food processor and whip. Check for seasoning. Leave to cool. Garnish: mix ingredients and add olive oil, lemon and salt to taste. Use this as a topping for the cooled skordalia. Eat with bread, pitta or carrot, cucumber or red pepper batons or fried strips of courgette, red pepper and aubergine. Strangely the cold Skordalia goes very well with hot fish such as oven baked salmon or cod. 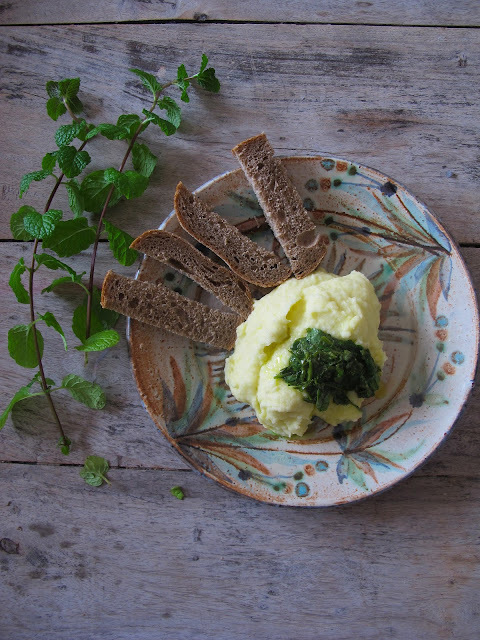 Great post, I love skordalia … one of my favourite potato dishes, first time I made it I ate the lot (I am prone to greed) so had to make a second batch to serve for dinner. looks so yummy. This is a simple recipe, but its so good. The combo of mint with potatoes is by default so delicious & great ! I had a little giggle at the fact that your blog is called 'The English can cook' and that the first two posts I saw mentioned other countries' cuisine. This looks delicious.. with walnuts too, yum! Miriam: you are absolutely right. I suppose I called my blog The English can cook because I'd lived for years in France and got sick of the French saying our food was terrible. But actually, especially as I'm a non meat eater/cook, I don't really cook much English food! yes! yes! yes! kudos for making this; people often turn those nose up at simple dishes like this but when the flavours are just right, it can be perfect. lovely work. Great recipe, one of my favorite potato dishes, very different and is great like an appetizer. I get the feeling that Peter Andre is a very nice person, and you can't deny that he has russet skin and possibly a firm inside.